About this Fragrance ~ Open your window. It's Spring and the Lilac has just begun to bloom. A gentle breeze brings in the fragrance of this light, delicate blossom. This scent is so authentic, and oh so pretty, down to its rich, deep lavender bouquet. 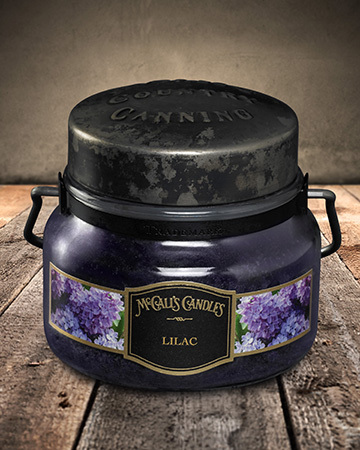 About this Product ~ Our Double Wick Classic™ beauties feature our signature rustic metal lid stamped with the McCall's Country Canning logo and decorative handles.